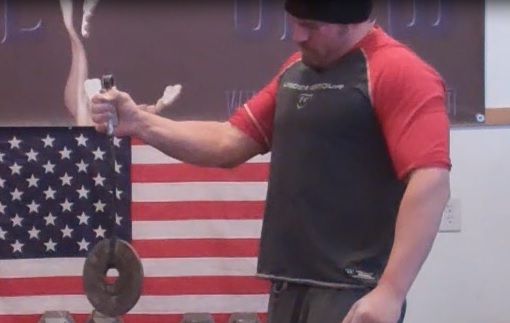 When you research Grip Strength Training enough you are sure to come across the name Jedd Johnson. He has over 1700 videos on YouTube mostly Grip Strength related. He is a World Record Holder and has won numerous Grip Sport Competitions. He offers online coaching for people who are looking to achieve their goals. He also has numerous Training DVD’s that are grip sport specific or feats of strength specific. We have several of Jedd’s Training DVD’s available on our website, and have picked up many great tips from these training videos! We are extremely happy that he had some time to chat with us a bit about Grip Strength Training and Captains of Crush Grippers! I run DieselCrew.com and I do many things. First and foremost, I’m a strength enthusiast, and I love doing many forms of training, and I’ve been a certified strength and conditioning specialist since 2001. 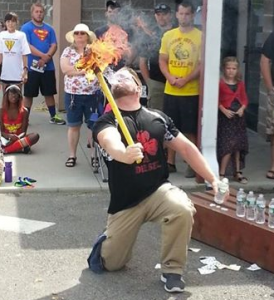 But I’m probably most well-known for my specialization in Grip Strength and Feats of Strength. What got in you into Grip Strength Competitions and how long have you been training? I’ve been doing serious training since 1999 or so. I found out about Grip Strength training in 2002 online. The same guy that I first read online talking about Grip Strength also put on the 1st competition I ever went to in 2003. I honestly wasn’t sold on putting so much time into training my hands, at first. But once I realized how fun it was, how much grip strength helped improve all my other lifts, and that I was actually pretty good at this stuff, I gradually became more and more serious about it. What is your ideal training session for Grip Strength? My ideal training session would be one where I plan exactly what I’m going to train that day, go down and train everything I want to without being rushed, and set new PR’s on every single facet of training that I work on that day. Unfortunately, that sessions has still never happened yet. I can close a #3.5 with a 20mm block set. I have closed some #3 grippers of varying difficulty with the credit card set. Some people may not realize it, but all grippers vary in strength. If you got one new in the 90’s, it might very well be harder than one you bought new in 2016. But if you bought one new in the mid 2000’s, it’s probably easier to close than one you bought new in the last few years. Some people see this is a problem, but I don’t. I think it’s great, because you’ve gotta be ready for whatever gets thrown at you. The only real way to know how strong the gripper is that you’re attempting is by rating it on a grip sport rating device. What is your favourite event / lift at the Comps? My favourite event in grip strength contests would probably be the Two Hands Pinch. I’ve set world records in it something like 5 times. For a long time I was the best in the world at it, because that was what I put my most effort in. These days, I’ve backed off on specializing on that as much, and spreading my time out over all the different disciplines, with the end goal of winning championships. First off, I’ve been doing this a long time. My first contest was in 2003, so it’s been a WHILE. Over that time, I’ve done just about every program that was put out there, and I’ve come to realize what works well for me, and what doesn’t work very well at all. I also have a good idea how I’ll recover from various methods of training, and I’ve come to avoid things I know that are high risk, for me. Any day in the gym is better than a day on the shelf, meaning I’d rather be able to consistently get into the gym and enjoy the pursuit of strength than be injured and not be able to enjoy training as much as I do. So prevention has become a big part of how I approach training. What is your favourite thing to cook on the BBQ? I haven’t cooked very many different things on the BBQ, and some of the stuff I have cooked hasn’t turned out so well. But, I’ve come to find out that I can do a great job with steaks on the grille. I usually have some onions going, wrapped in tin foil, and sometimes even some asparagus, as well. That’s little combination is quite a treat, in my opinion. For a bonus, I might even heat up a baked potato in the microwave. I hear you are a big wrestling fan; who is your favourite wrestler? Oh yes, I absolutely love pro wrestling. I used to watch as much as I could as a kid, and Hulk Hogan and Ultimate Warrior were my favourites at that time. Once Monday Night Raw came out in January of 1993 (Happy 24th Birthday, RAW!) I was hooked, and have watched almost every single week since then. Only time I fell off was when I was extremely busy with my studies in college. My all-time favourites would be 1) Undertaker – I started taping all of his matches when he was still a heel. 2) Ultimate Warrior, and 3) Sid Vicious – I began my tape library when he was still in the WWF the first time around, between Wrestlemania 7 and 8. If you were to give some advice to anyone looking to get into Grip Strength Training what would it be? 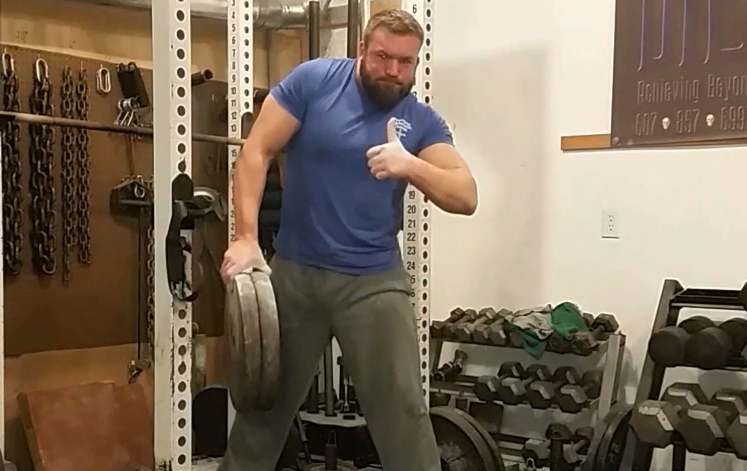 The best advice I can give anyone is that all grip strength lifting, feats, etc., have technique involved with them, and you need to learn these techniques in order to excel. What I mean is, it may seem like I’m just plopping a gripper in my hand to close it, or just randomly laying my hand onto a block weight in order to pick it up, but there’s actually much more to it. The nuances of just the gripper technique itself is way more than can be included in this interview. The difference that proper technique makes to how well you progress in training is so big, that I wanted to help people out in their training and started writing eBooks and producing DVD’s about grip strength training and feats of strength in 2005. I’ll be totally honest, brother. I love arm training. So I’d say, either Barbell Curls with Globe Gripz, or some kind of Dumbbell Curls are probably my absolute favourite. 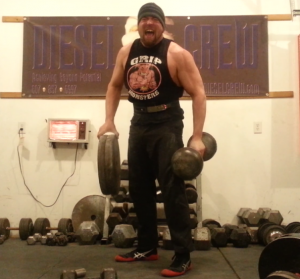 From there, I like Block Weight Training the best of all grip training methods. To round out a Top 5, I’d have to go with Overhead Training, maybe a Barbell Military Press. Then I’d throw in there Heavy Dumbbell Rows, no straps. I like doing like 120-150 or more, no straps, and no bracing, at gyms when I travel. It gets some crazy looks. To round out the Top 5, I’d say some kinds of Grip Pull-ups, variations where you hold something that’s really thick or otherwise challenging to do Pull-ups or Chin-ups on. 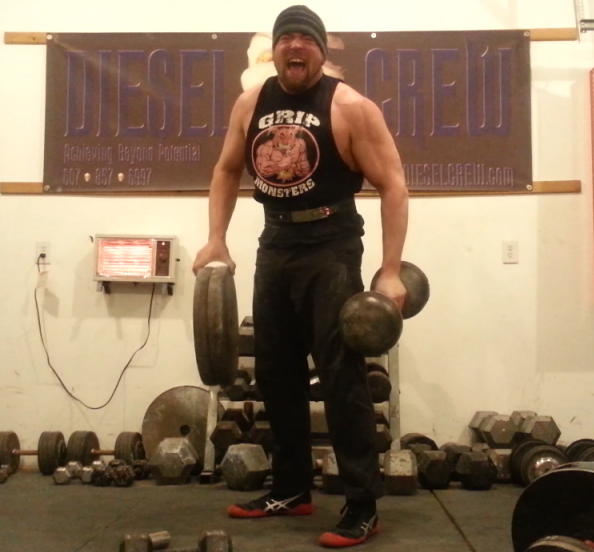 On February 18th, I’m holding and competing in the Winter Grip Fest. Pretty much each year I hold a comp in February and name it something different each year. One year it was Grip Hog’s Day, then Cold Snap Classic. This will be a 5-event competition featuring, IronMind Silver Bullet, both #3 and #4 will be contested, Two Hands Pinch, Pickaxe Lift to the Front, Bull Ring Hub Lift, and Pinch Block Hold for Time. After that, I’ll also be running a couple other competitions this year, and going to Nationals. What is coming up next for Jedd Johnson? I’ll be releasing several new eBooks and DVD’s this year. The first one is Indestructible Elbows, and eBook on elbow and forearm injury prevention. I’ve got a Pickaxe workout coming out, as well as an instructional DVD on Pickaxe training, a DVD on Arm Wrestling training, and many other products in the works. Plus, I’m always adding new content to my members only instructional website, TheGripAuthority.com. How can people follow you or contact you? Thank you Jedd Johnson for your time! We appreciate your knowledge and expertise in the Grip Sport World and look forward to seeing BIG things from you in the future!